Because we produce our whisky in very small batches - meaning each barrel yields approximately 300 bottles - our releases are quite limited. Sign up to add your name to the Whisky List, and we will make sure you get first dibs on all Whisky releases! We love whisky, and although ours are classified as Canadian whisky, we are quite partial to the Scottish whisky making tradition. By adhering to the strict rules of Scottish whisky making, we avoid having to use additives and androgynous enzymes (we don’t know what that word means either) and only have three ingredients in our whisky: grains, water, and yeast. Our mashes are extremely small, typically 1500 lbs, we use the finest Saskatchewan grains - and some imported malted grains - and we work with different proprietary yeast strains. When mashing, we either follow the Scottish technique of lautering, which involves separating the sweet liquid wort from the grains, and ferment just this liquid, or sometimes we use the Irish style of mash, fermenting and distilling on the grain. Our Single malt whiskies are extremely rare, as almost every mash is different, so no two barrels will ever be the same. 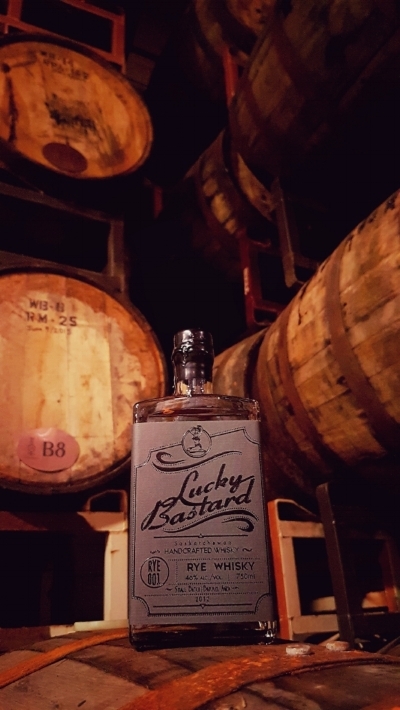 Each bottle will be marked and labelled as coming from one single barrel and as such will be available in very limited releases. To give you a glimpse of the different mashes we make, some are straight malted barley (from various grain varieties), while others are real malted rye whiskies. For some whiskies, we import heavy-smoked and peaty grains from Scotland, and for others we make various styles of un-hopped beer, such as ales, lagers, and stouts, and distill them to whisky. We have even added Saskatchewan-grown quinoa to a whisky batch, and we have other whisky varieties that incorporate ingredients such as hemp seed, hops, chocolate, and vanilla beans. Staying true to our roots, we have also added fresh Saskatoon berries and sour cherries to some of our whiskies. As our creativity takes over, we will continually explore more and more varieties of these whiskies. Well, I think you get the picture. Our whiskies are distilled in very small batches and only distilled twice in our hand hammered copper pot still. By only distilling our whisky to a maximum of 78% alc. / vol. we maintain a lot of the flavour profiles of the grains, water, and yeast. We are not chasing the yields of the larger distilleries because we focus on quality, not quantity. What starts with grains ultimately ends in a barrel. Our cooperage is almost as unique as our mashing, as each grain offers a unique and different flavour profile, so too does our choice of barrels. A lot of the flavour profile of a whisky comes from that barrel. American white oak offers a lot of vanillas and caramels while French oak is fruity and peppery. Even the choice of char (how deeply burned the barrel is inside) affects the flavours and tannins. While most of our whiskies will be aged in once-used Bourbon barrels from Kentucky, we also use brand new American oak barrels with various char levels as well as once used French oak wine barrels to finish. Alas, all this creativity comes at a price as we will age for a minimum of three years. As a matter of fact, most of our whisky will be aged much longer than three years, but trust us, they will be worth the wait!